The following is an "accurate" account of the event on 9 March 1953. Hugh W. "Skip" Burnside, who at the time, was an AB3 who came aboard BENNINGTON when she was re-commissioned at the New York Naval Shipyard provided it to me. 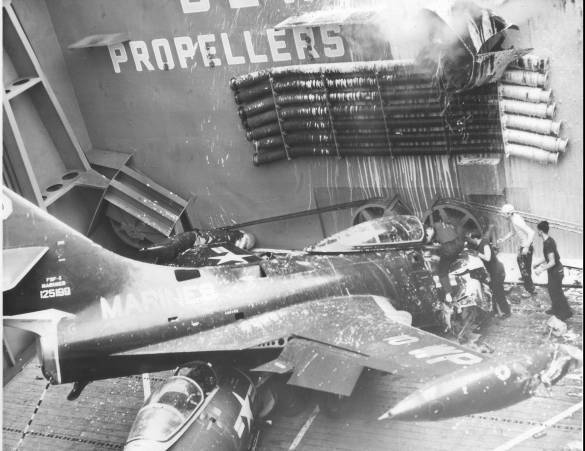 We had three crews on the Hanger Deck the day of the accident. The AB's were gentlemen by the names of Rouse, Callahan and myself. My crew had just taken an aircraft from the #1 Elevator and spotted it just forward of the #2 Elevator on the port side. The next plane had come down the elevator and Rouse's crew went on the elevator to remove it. A young airman by the name of Ricketts was the nose-bar man for Rouse's crew. Ricketts had just started to hook-up then my crew moved to position ourselves next to the elevator operator, right by the Captains Access Ladder. went through the barricade's, then slid down the flight deck through the restraining rails and dropped off down the #1 Elevator shaft. 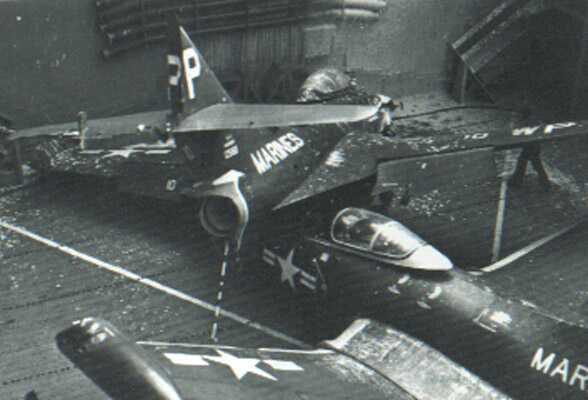 The nose of the plane hit the forward bulkhead, slid off to the left and came down atop another F9F-4 of VMF-223, which was on the elevator. It was still at full power and the jet blast was spewing flames at the #1 Aviation Fuel Control Panel located there. I and another member of my crew went to the stationary fire control line just aft of the elevator and turned it on full blast with foam. I then left my crewmember and proceeded to the #2 Elevator and shut the fire doors separating Hanger Bay #1 from the rest of the ship. The next thing I saw was a pilot running toward the fire doors with his parachute. It must have been the pilot from the plane. 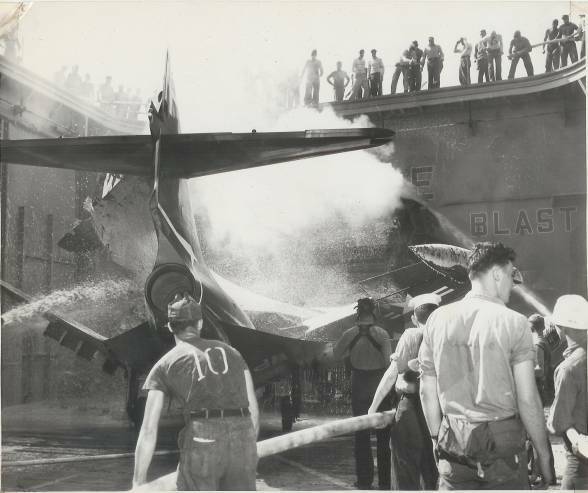 Lt. Clemons who was in charge of the Hanger Deck climbed atop the plane just aft of the cockpit and reached down into the air intake flaps and pulled what he called a "safety link" which saved both planes and the fuel station from going up in flames. By this time, there was at least 2 feet of foam on the elevator and chaos was finally turning into sanity. After making sure the planes were under control, we tried to find our crews. 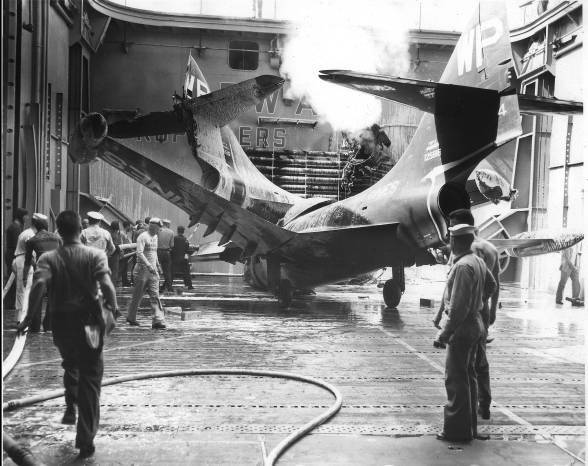 Most injuries to the 40 or so crewmembers were minor, with the exception of airman Ricketts. He was under the first plane when the second landed on it. Airman Ricketts was taken to Sick Bay, then transferred to the base at GITMO. We were able to visit but ONLY to ask of his condition. At some point in time he was transferred again to a Naval Paraplegic Hospital in Richmond, Virginia. My last contact concerning Ricketts, I was told he remained there and was later discharged medically because his condition never improved. I will never forget this incident. The guns sticking out of the bulkhead and the nose cone just hanging there. It was a miracle that no explosion occurred or that people were not killed. 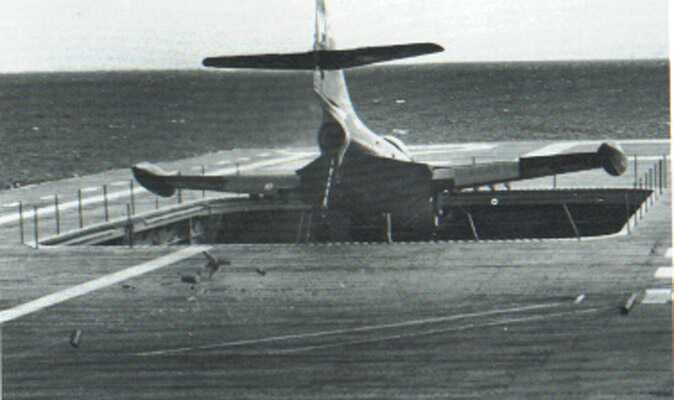 The quick action of the plane crews and the assistance of the Marines helped in stopping what could have been a major disaster. I have visited this site many times over the last several years and I don't know why I never have written before. My name is Joseph W. Pfeiffer and I was on the ship from 29 Sept.1952 to 27 May 1954. Then stationed at Q. P. R.I.Naval Base till I was discharge in July. I was an AN assigned to the V1 Division and in Rep8, crash and rescue on the flight deck. I wore the hot suite during flight operations. 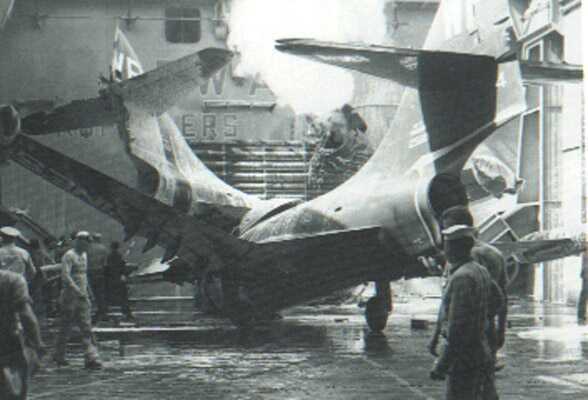 I have read the stories over and over again about the March 9 1953 F9F crash. 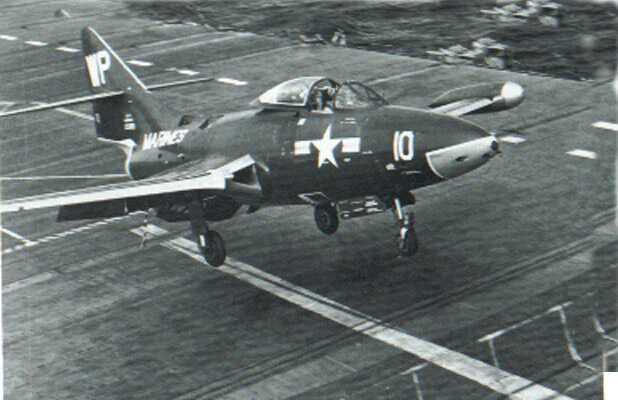 The F9F story as I recall it is pretty much on the money. I was on the flight deck and saw the plane come in. the plane came in hot and broke part of the tail hook off. You can still see most of it in the pictures. it flew through the eleven foot nylon barricade, bounced again and went down the pit. a medical core man and I went in and got the pilot out. Those guys on the hanger deck were great, and they did save the ship from some serious harm. and carried four 20mm cannons in it's nose. The Panther was America's first jet to see combat. It would be an honor to let you include my story in the history of the bennington. I often wondered what happened to the other members of the hangardeck on the bennington. When we recommissioned the Bennington, and I was put on the hangar deck, I was the only petty officer on the hangar deck with prior experience on a carrier under flight quarters. I had to leave the ship just prior to the med cruise in l953, I think August or September, they sent me to the USS Antietem at brooklyn navy yard and then to brooklyn naval center . I was discharged after 5 years in the navy on december 11, l953. Good luck with your web site, I'll be looking at it from time to time. I also remember the boiler room explosion if your interested.